The ERAS Society (International) was officially founded in 2010. The mission of the Society is to develop perioperative care and to improve recovery through research, audit education and implementation of evidence-based practice. 2001- 2004 The ERAS Society has its roots in what was called the ERAS Study Group. Comprised of leading surgical groups, the ERAS Study Group was assembled by Professor Ken Fearon and Professor Olle Lungqvist in 2001 to further develop ideas put forth in the 1990s by Professor Henrik Kehlet concerning the concept of multimodal surgical care. In addition to the above, Profs Arthur Revhaug, Univ Tromsö, Profs Martin von Meyenfeldt and Cornlius deJong, Univ Maastricht were the original members of the ERAS Study Group.The ERAS Study Group soon discovered that there were a variety of traditions in use in different units. There was also was a great discrepancy between the actual practices and what was already known to be best practice, based on the literature. This prompted the group to examine the process of change from tradition to best-practice. 2005 The ERAS Study Group developed and published an evidence-based concensus protocol for patients undergoing colonic surgery. 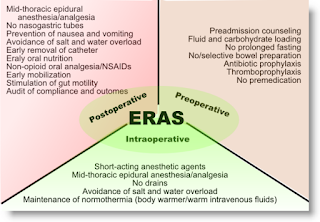 2009 The ERAS Study Group updated the evidence base to include rectal surgery. 2010 The ERAS Society was formed in Stockholm, Sweden. 2011 1st National symposium supported by the ERAS Society, held in San Raffaele hospital in Milano June 17, 2011. 2011 The 2nd National symposia supported by the ERAS Society was held in Lausanne, Switzerland at CHUV. At this symposia Swiss hospital teams were invited to join the 1st Swiss ERAS Implementation program. 2012 The 1st Swiss ERAS Implementation program was initiated under the leadership of Prof N Demartines at CHUV. The 3rd Swedish ERAS Implementation program involving the South East Region of Sweden choosing ERAS implementation as their prime target for improvement in cancer care under the national Regional Cancer Center. 2012 The 1st International ERAS Society congress was held in Cannes France. This attracted the leading investigators in Enhanced Recovery and delegates from over 30 countries and 6 continents. The 1st Henrik Kehlet lecture was delivered by Prof Henrik Kehlet. Many of the lectures are available on this web site and more will come, along with interviews with some of the world experts in ERAS. 2012 ERAS UK held a national conference in Cheltenham November 2-3. The McGill ERAS group held the 3rd Canadian ERAS conference November 23rd. ERAS was presented in France at the French Surgical Society in Disney Paris lead by Prof K Slim. 2012/2013 Three new and updated ERAS Society guidelines on Coloci, Rectal and pancreatic resections published in World Journal of Surgery and Clinical Nutrition. 2013 The second ERAS Implementation program initated in Lausanne March 25. The 1st French ERAS symposia held in Paris under the leadership of prof K Slim and P Alfonsi, April 5. 2013 The 3rd ERAS Society Train the Trainers run in Calgary, Alberta, Canada for the Alberta Health Service and Inner Health, British Colombia. 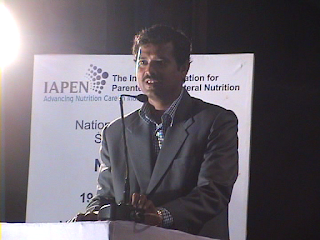 The National Conference on Surgical Nutrition, 19th December, 2013, was initiated by the Mr. Koushik Chatterjee (Right side Photo), Freelancing Nutritionist working in Bardhaman (a small town, 64 kilometers from Kolkata), West Bengal with a theme ERAS Early Recovery After Surgery. The chief guest of the conference was Dr. Amit Benerjee, Hon. Vice Chancellor, West Bengal University of Health Sciences, Kolkata, West Bengal, India. The organizing committee includes, Dr. Bhaskar Ghoshal, Joint Organizing Secretary, NCSN-2013 and Dr. Koushik Saha, IAPEN Regional Officer, Agra, Dr. Chaitali Dutta, Associate Member of Executive Council, IAPEN and Principal, DSMS College, Dugapur, West Bengal and Dr. Paromita Das Dutta, Chief Dietitian, Chittaranjan National Cancer Institute, Kolkata, West Bengal. The total delegates for this important function was greater than 200. IAPEN members, wish to express their profound gratitude and deep regards to Mr. Koushik Chatterjee for his exemplary services and constant guidance for smooth conduction of this important event. Dr. Ashutosh Sharma, Founder Member, IAPEN and Regional Officer, Kanpur, Uttar Pradesh, in his plenary talk, explained the implementation of ERAS Early Recovery After Surgery in developing countries. Based on his concept and ideology, IAPEN has initiated an ERAS-India, a Core Group of IAPEN, for development and implementation of ERAS concept in Indian Hospital Settings. 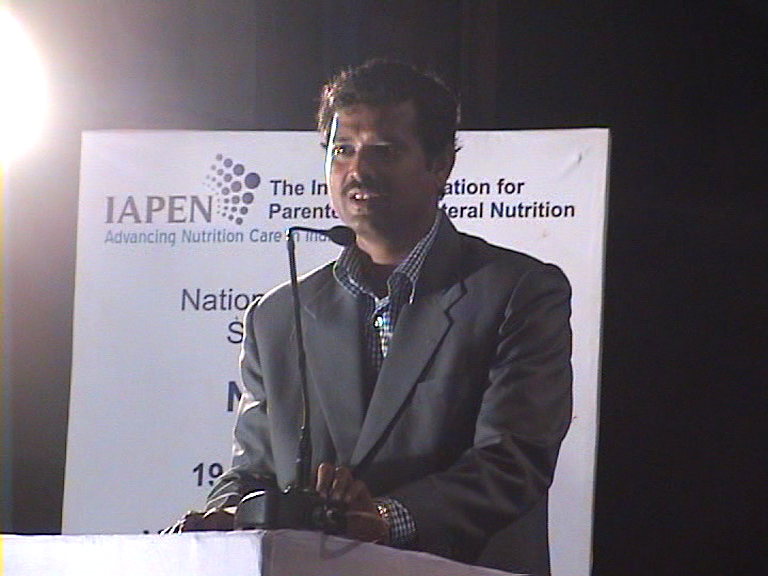 He was also appointed as the Programme Officer for ERAS-India, A core group of IAPEN. 2015: EnHANS: A Two Day National Conference on Enhanced Recovery After Surgery and Nutrition for Surgeons (EnhaNS - 2015), 31st October to 1st November 2015, Hotel Green Park, Chennai. Step 1: IAPEN from 2017, is planning to conduct minimum 30 meetings thoughtout India for developing these guidelines by involving minimum 1000 surgeons and nutrition support clinicians throughout India. Step 2: The minutes of the meetings will be collected for preparation of standard ERAS guidelines for Indian Population. Step 3: ERAS conferences, seminars and workshops will be conducted for popularizing ERAS in India. 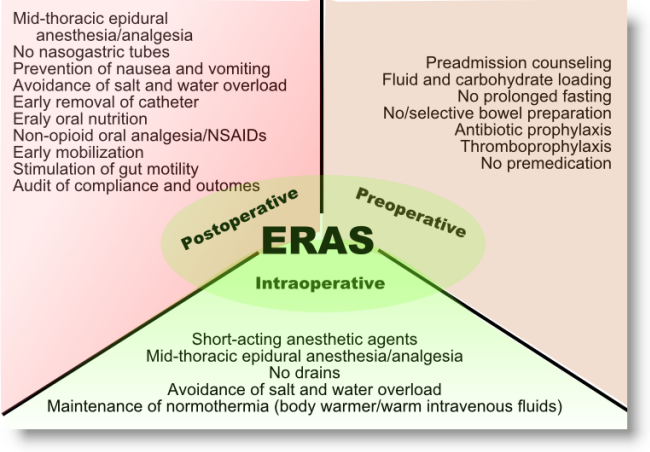 The ERAS Implementation Program is a ERAS specific training program designed and customized for your perioperative care team to implement, reach and mantain a high compliance level to the different ERAS Protocols available. It focuses on building well-functioning teams from various units involved in surgical care, introducing highly specific changes to current routines to conform to best-practice, and providing the tools to monitor and analyze the effects of those changes, through ERAS Interactive Audit System. Implementing the ERAS Care System requires commitment. It requires changing the way some things have been done in the past. It requires tight, coordinated teamwork among those involved in perioperative care. In addition, the active involvement of the management team of the hospital is critical. With these in place, your surgical center is well on its way to achieving improved quality of life for your patients, much improved control of the perioperative care process for your staff and management, and the proven and significant savings that the ERAS Care System provides. Your hospital or clinic assembles an ERAS Team of 4-6 people, consisting of doctors and nurses from the surgical clinic as well as anesthesiology, intensive care and post-op care, and possibly a representative from the quality control team of the organization. One person from each team is appointed as a project leader and is responsible for registering the patient data in the ERAS Interactive Audit System. The ERAS training courses are built on education methodology based on the Breakthrough Series, developed by the Institute for Healthcare Improvement in Boston. The method is well-proven and has shown very good, lasting results. There are four seminars in the course, taking a total of 5 days. The seminars are offered over a period of 8 – 10 months, and are alternated with local implementation work at your hospital. The hospitals ERAS Team attends the seminars and is given coaching and supervision as it implements and uses the ERAS Care system. Experts from the ERAS Society also give lectures as part of the program. In order to ensure the success of this change process, the active leadership of the clinic chief is required to make sure that team members are allocated sufficient time to work on this project. In addition to attending the seminars and working on the implementation, the project leader may require up to 20 hours/week to register patient data in the ERAS Interactive Audit System..